The 95-foot-tall scarlet oak tree on the northeast corner of NE 77th Street & 38th Avenue NE in Wedgwood is mentioned in Arthur Lee Jacobson’s book, Trees of Seattle, as one of the most outstanding of its type in the city. A variety of oak native to the East Coast, 38th Avenue’s enormous scarlet oak tree must surely have been planted there by someone — but by whom? The towering scarlet oak tree is on the corner of NE 77th Street and 38th Ave NE in Wedgwood. Could Delmar and Mildred Hall have planted the tree? The Halls came to Seattle in 1906 from New York, leaving all behind to start a new life in the West. Delmar’s first job in Seattle was as a clerk at J. Berkman & Bro. wholesale men’s furnishings in Pioneer Square. Delmar next went to work for Golden West Baking Company on South Massachusetts Street, then worked as a dairy driver and then as a laundry truck deliveryman. Because they were childless, the Halls both held jobs and they saved their money towards buying land. In 1920 the Halls achieved their goal: they built a house at 7744 38th Ave NE and listed themselves in the Seattle city directory as “farmers and poultry breeders.” As the earliest residents on this block of 38th Ave NE, could the Halls have planted the scarlet oak tree as a remembered favorite variety from their home state of New York? In the May 1956 edition of the Wedgwood Echo community newsletter, the Halls told how they came to Seattle and how they had seen the Wedgwood neighborhood grow up. Mrs. Hall told of planting maple trees in the yard of their home. Nels and Hilda Thuesen might have been the tree-planters on 38th Ave NE. The Thuesens emigrated from Denmark in the 1890s. After a stop in Oregon where their son was born, the Thuesens came to Seattle at about the same time as the Halls. Nels’ first job in Seattle was as a messenger for Northern Express Company on First Avenue/corner of Marion Street. Unlike the job-hopping Delmar Hall, Nels Thuesen stayed with the same company for the next twenty years. When Nels and Hilda’s only son, Veniss Wellington Thuesen, became old enough to work, he got a job at Schwabacher’s, the well-established downtown Seattle department store, and he stayed in that occupation for more than ten years. Like the Halls, the Thuesens dreamed of living a rural lifestyle. In 1925 the Thuesens joined the Halls on 38th Ave NE, where they bought the southern end of the block nearest to NE 77th Street. The Thuesens built a house at 7727 38th Ave NE and began a nursery business called Lily of the Valley Garden. 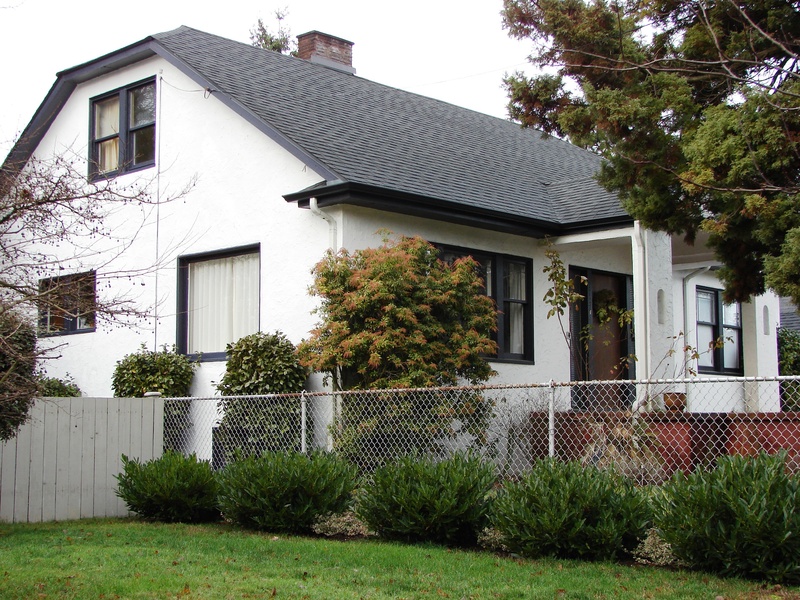 The Thuesens built 7727 – 38th Ave NE in 1924. They listed themselves in the Seattle city directory as the Lily of the Valley garden business. To this day, remnants of greenhouse cement foundations and irrigation systems, legacy of the Thuesens’ nursery business, still remain in the backyards of homes on 38th and 39th Avenues NE just north of NE 77th Street, later developers not wanting to go to the trouble to dig it all up. Our conclusion: who planted the tree? So who planted the tree on the corner of NE 77th Street & 38th Ave NE? We’ll never know for sure, but because they were in the nursery business, the Thuesens are the most likely candidates. Whoever they were, Wedgwood’s mystery tree-planters left a legacy, the spectacular scarlet oak, for us to enjoy. 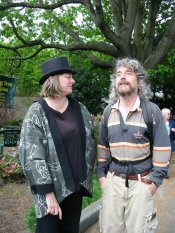 Heritage Tree award ceremony: Cass Turnbull, president of Plant Amnesty, and Arthur Lee Jacobson, Trees of Seattle. On May 31, 2008, the scarlet oak was honored in a special ceremony naming it a Heritage Tree. The Heritage Tree program is a joint venture of the Plant Amnesty organization and the City of Seattle’s Office of Urban Forestry. At the ceremony, City of Seattle Arborist Nolan Rundquist told of being awestruck when, while supervising tree pruning work on a nearby street, he rounded the corner and came upon the scarlet oak. Mr. Rundquist immediately submitted the tree for nomination to the Heritage Tree award. With the homeowner’s permission, at the Heritage Tree award ceremony a recognition plaque was placed near the base of the scarlet oak. Arthur Lee Jacobson, author of Trees of Seattle, provided the description written on the plaque that this scarlet oak is the largest of its species in the city. Mr. Jacobson estimated the tree to be at least 60 to 80 years old and it grew faster than others of its species and age due to ideal conditions. The soil surrounding the scarlet oak tree is rich and moist and the tree was planted in a clearing where it received full sun. The tree’s roots did not “search” out to the sides and push up the sidewalk because the tree has found plenty of ground moisture to support its growth. At the Heritage Tree award ceremony that day, Sen. Ken Jacobsen (Washington State Legislature, 46th District) drew a comparison of Wedgwood’s scarlet oak to trees which, in past centuries, were meeting places for kings. “This is a worthy tree for us to meet under,” Sen. Jacobsen said. The majestic scarlet oak still reigns over its corner in the Wedgwood neighborhood, reminding us of a era when Wedgwood was home to would-be farmers, poultry breeders and nurserymen like the Halls and Thuesens of 38th Ave NE. Cass Turnbull 1951-2017, founder of Plant Amnesty, protector of Seattle’s trees and green spaces. Photos of the May 31, 2008 Heritage Tree ceremony courtesy of David Atcheson. The Hall house was torn down in 2009 and a new house built in its place. The Thuesen house still stands. Information on the Heritage Tree program. SDOT Tree Crew Supervisor Joe Markovich works on Wedgwood’s scarlet oak tree in June 2016. “SDOT Urban Forestry will be installing a cabling and bracing system including hard-to-source materials from Seattle City Light’s warehouse. Portions of the system are rated at 54,000 lbs. tensile strength in order to provide significant reduction in risk. SDOT is committed to performing an annual inspection of the cabling system and will make adjustments to the system and/or the tree as needed to ensure the system continues to provide the intended benefit. 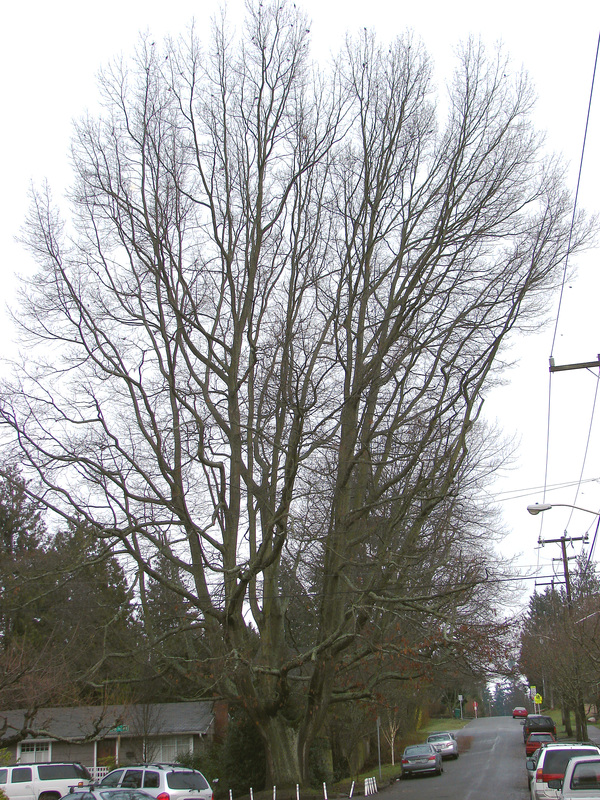 SDOT estimates that the system could add 10 years or more to the life of this otherwise healthy and vigorous tree. This entry was posted in trees and tagged NE 77th Street, Neighborhood History, scarlet oak, Seattle. Bookmark the permalink.